As humans, we want to fit in. We want to be like others around us and others we look up to. So much of the marketing we see out there hones in on that fact to try to get us to buy what they are selling. It is okay that we are not all the same. It is even good that we are not all the same. This concept can be difficult to grasp, especially in our youth. As I have gotten older, I have come to really grasp, understand, and accept that fact. Once we do accept that, life actually gets so much better. When we work with others who are different instead of pushing against others who are different, our results are even better! Let me illustrate with an experience from this past summer. I was asked to be over camp for the young women in my ward (church congregation). This is ages 12-18. Each summer, they go camping where they unplug, grow closer to each other, bond with their youth leaders, and hopefully grow stronger in their faith. I was told I could ask an assistant to help me. Well, of course I wanted (and needed) an assistant! I was very prayerful in who my assistant should be. One day, the answer hit me, as I hoped it would. She accepted and off we went. This is a woman I get along with very well. We have a lot of similarities, but we also have some very, very strong differences in our personalities (when we were at camp, we played a “would you rather” game, and we chose opposite answers almost every time). As we worked together, I saw how beneficial it was to the overall picture that we are different. Her strengths are my weaknesses. Without her help, there would have been gaps in what we did. With it, it was whole. I love that quote. If we were all the same, how boring would that be?!? This quote is applicable in all areas of life, but in the interest of parenting, I wanted to focus on a few things. 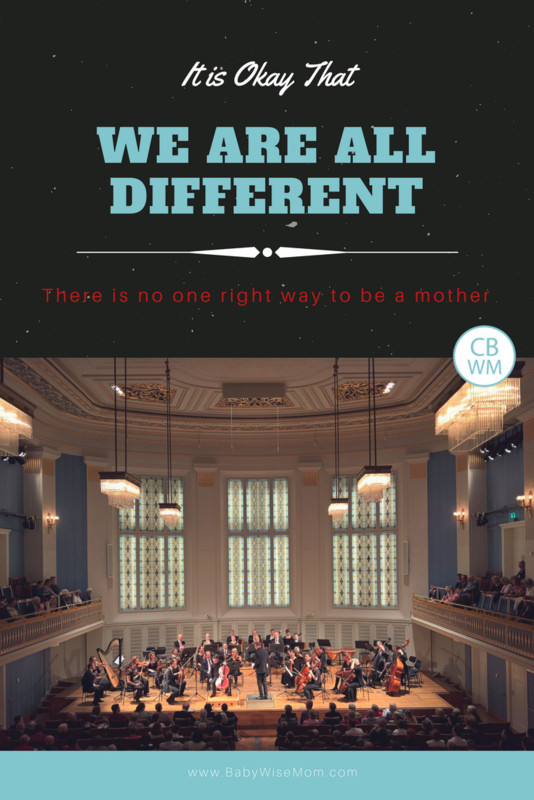 First, if other mothers parent differently than you do, that is okay. The vast majority of parents out there want the best for their children and are taking measures to be good parents. Different doesn’t mean bad. It doesn’t mean either of you are wrong. It just means different. We are all in the orchestra together. We all have different instruments. We have different timings. Some have the melody. Some have the harmony. Some have a counter-melody. Sometimes we borrow a note we like that we heard from someone else. Sometimes our notes are completely dissonant. 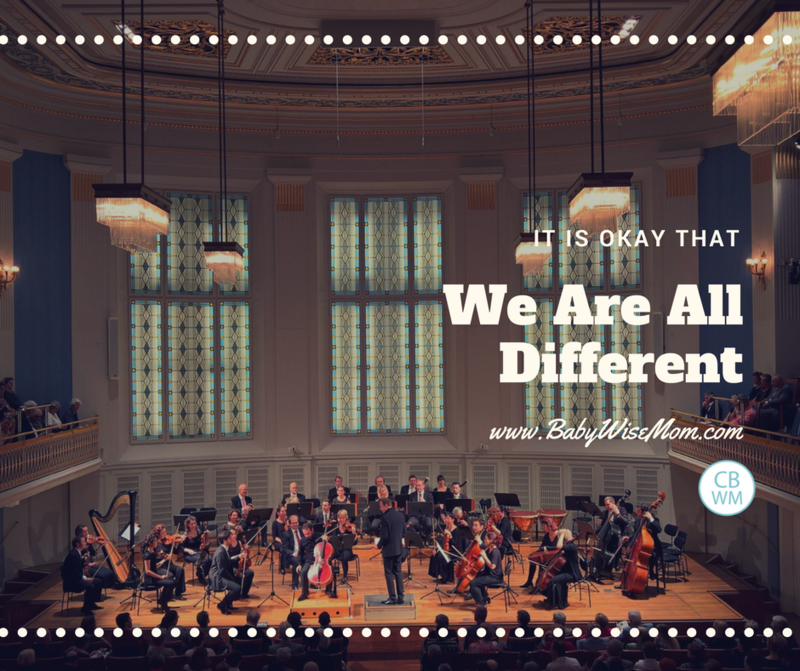 While the specific notes and timings we may be playing are vastly different from each other, we are all playing the same song. When all of those notes come together, the results are beautiful. The second point I wanted to make was that each of your children will be different. That is okay. You may have dreamed of having a flute player, but it turns out your child is more of a tuba player. That’s okay. We need all of the instruments in the band. This means you may have hoped your child would be a star athlete. That might not be the case. Find out what your child is. You may have hoped your child would share your love for mechanics. That might not be the case. Find out what your child loves. You may have hoped for an artist, a horseman, a musician, a baker, a dancer, an academic…there are so many things we can imagine and hope our children will be. This hopes can stem from wanting to share what we loved as children or stem from wanting our children to be good at the things we weren’t good at. Help your child find his or her instrument. Accept that. Embrace that. Cultivate that. It is okay that we are not all the same. It makes for a richer world and sweeter sound. Previous Post Brinley Summary: 5 Years Old!